Update to March 1 study. Any insight historically relative to the S&P 500's recent ratio of closes above 200-day to closes below 200-day? Rare S&P 500 momentum setup (1950-2019). 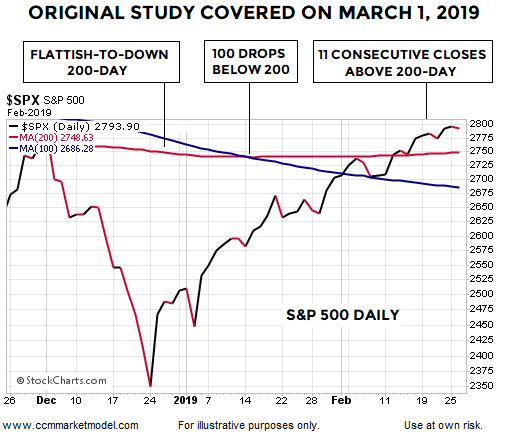 A March 1 analysis covered historical cases similar to the 2019 setup shown below, where the S&P 500’s 100-day moving average (blue) dropped below a flattish-to-down 200-day (red). Stocks rallied and the market closed above the 200-day for eleven consecutive trading days. 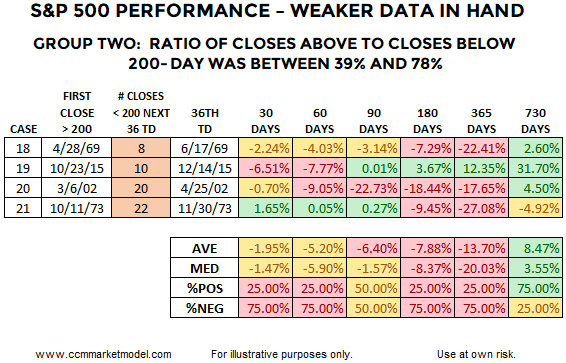 If we fast forward to April 3, 2019, the S&P 500 only closed below the 200-day twice during the period spanning thirty-six trading days. A ratio of 2/36 speaks to limited selling pressure. The tables below provide a “walk forward” update to the same cases covered in the original March study. 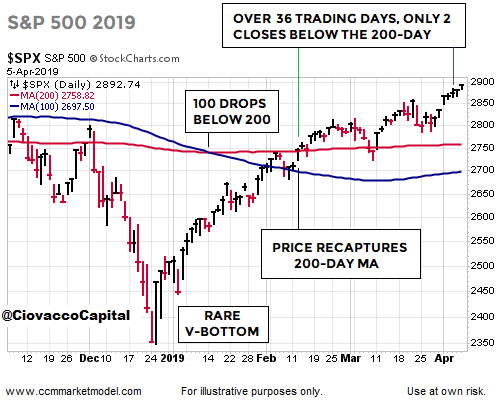 Our goal in the updated study was to see how the stock market (VTI) performed in the historical cases taking into account the number of daily closes below the 200-day in the same thirty-six trading day window. The strongest cases are shown in group one. 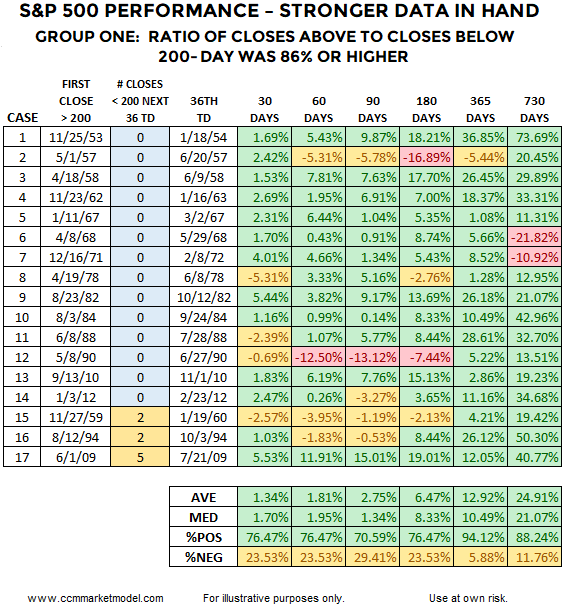 In each instance, the number of closes below the 200-day in the thirty-six day period was five or less (column three below). The 2019 case fits into group one since there were only two closes below the 200-day in the thirty-six day window. The second group features cases with weaker evidence over the thirty-six trading day study period. In group two, selling conviction was strong enough to create between eight and twenty-two closes below the 200-day (third column table below). As we might expect, group one performance (stronger trends) was noticeably better than group two (weaker trends). In group one looking out one year, the average S&P 500 (SPY) gain was 12.92% and 94% of the eighteen cases featured positive returns. Group two cases produced an average loss of 13.70% after one year, with only one profitable case. We can learn a lot about the market’s present-day health by tracking and observing present-day facts; a concept that is quite a bit different from attempting to predict or forecast an uncertain future. This week’s stock market video covers a recent rare setup on the weekly chart of the S&P 500 (VOO) and subsequent stock market performance looking out three years. Some basic concepts regarding trends shed additional light on the data above. 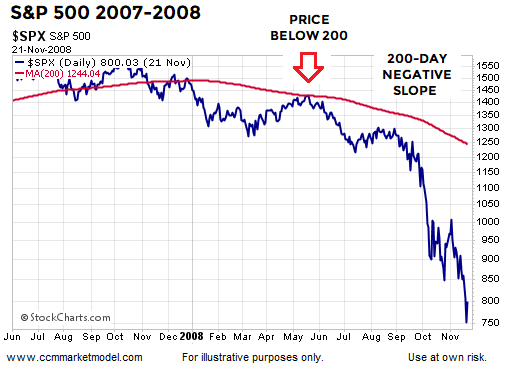 Lower probability markets tend to stay below their 200-day moving average and often feature a downward-sloping 200-day. Indecisive or range-bound markets tend to feature flattish moving averages and price oscillating above and below the moving averages (left side of chart below). 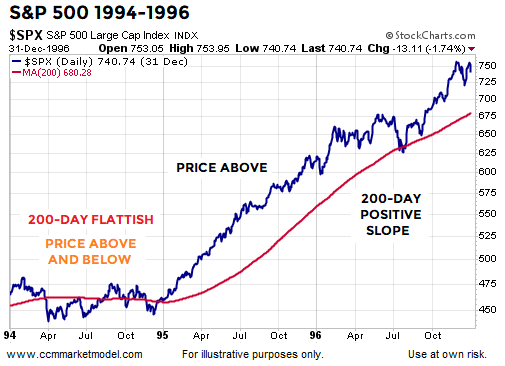 Healthy and sustainable long-term trends tend to feature a high percentage of trading days that close above the 200-day (right side of chart below). Thus, the longer a market can stay above the 200-day in the early stages of a rally attempt, the higher the odds we are dealing with a new trend rather than a countertrend move that will be followed by lower lows. In 2019, the S&P 500 (IVV) is trying to transition from the flattish/indecisive stage to the upward-sloping/higher-conviction stage. Thus far, selling pressure has not been strong enough to push and hold the S&P 500 below the 200-day moving average. Should fundamental issues come to light that create a shift in sentiment resulting in a prolonged stay below the 200-day, 2019 odds would begin to deteriorate in a bearish manner. We will continue to take it day by day open to all outcomes. Disclosure: I am/we are long SPY. I wrote this article myself, and it expresses my own opinions. I am not receiving compensation for it. I have no business relationship with any company whose stock is mentioned in this article.